Cardiac cells undergo depolarization and repolarization to form cardiac action potentials about sixty times per minute. The shape and duration of each action potential are determined by the activity of ion channel protein complexes in the membranes of individual cells, and the genes encoding most of these proteins now have been identified. Thus each heartbeat results from the highly integrated electrophysiological behaviour of multiple proteins on multiple cardiac cells. Ion channel function can be perturbed by acute ischemia, sympathetic stimulation, or myocardial scarring to create abnormalities of cardiac rhythm, or arrhythmias. Available antiarrhythmic drugs suppress arrhythmias by blocking flow through specific ion channels or by altering autonomic function. An increasingly sophisticated understanding of the molecular basis of normal and abnormal cardiac rhythm may lead to identification of new targets for antiarrhythmic drugs and perhaps improved therapies. Arrhythmias can range from incidental, asymptomatic clinical findings to life-threatening abnormalities. Mechanisms underlying cardiac arrhythmias have been identified in cellular and animal experiments. In some human arrhythmias, precise mechanisms are known, and treatment can be targeted specifically against those mechanisms. In other cases, mechanisms can be only inferred, and the choice of drugs is based largely on results of prior experience. 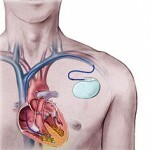 Antiarrhythmic drug therapy can have two goals: termination of an on-going arrhythmia or prevention of an arrhythmia. Unfortunately, antiarrhythmic drugs not only help to control arrhythmias but also can cause them, especially during long-term therapy. Thus, prescribing antiarrhythmic drugs requires that precipitating factors be excluded or minimized, that a precise diagnosis of the type of arrhythmia (and its possible mechanisms) be made, that the prescriber has reason to believe that drug therapy will be beneficial, and that the risks of drug therapy can be minimized. When the normal sequence of impulse initiation and propagation is perturbed, an arrhythmia occurs. Failure of impulse initiation may result in slow heart rates (Brady arrhythmias), whereas failure of impulses to propagate normally from atrium to ventricle results in dropped beats or “heart block” that usually reflects an abnormality in either the AV node or the His-Purkinje system. These abnormalities may be caused by drugs or by structural heart disease; in the latter case, permanent cardiac pacing may be required. Abnormally rapid heart rhythms (tachyarrhythmias) are common clinical problems that may be treated with antiarrhythmic drugs. Three major underlying mechanisms have been identified: enhanced automaticity, triggered automaticity, and re-entry. Enhanced automaticity may occur in cells that normally display spontaneous diastolic depolarization, the sinus and AV nodes and the His-Purkinje system. b Adrenergic stimulation, hypokalaemia, and mechanical stretch of cardiac muscle cells increase phase 4 slope and so accelerate pacemaker rate, whereas acetylcholine reduces pacemaker rate both by decreasing phase 4 slope and by hyperpolarization (making the maximum diastolic potential more negative). In addition, automatic behavior may occur in sites that ordinarily lack spontaneous pacemaker activity; e.g., depolarization of ventricular cells (e.g., by ischemia) may produce such “abnormal” automaticity. When impulses propagate from a region of enhanced normal or abnormal automaticity to excite the rest of the heart, arrhythmias result. Under some pathophysiological conditions, a normal cardiac action potential may be interrupted or followed by an abnormal depolarization. If this abnormal depolarization reaches threshold, it may, in turn, give rise to secondary upstrokes that can propagate and create abnormal rhythms. These abnormal secondary upstrokes occur only after an initial normal, or “triggering,” upstroke and so are termed triggered rhythms. Two major forms of triggered rhythms are recognized. In the first case, under conditions of intracellular Ca2+ overload (e.g., myocardial ischemia, adrenergic stress, digitalis intoxication, or heart failure), a normal action potential may be followed by a delayed afterdepolarization (DAD). If this afterdepolarization reaches threshold, a secondary triggered beat or beats may occur. DAD amplitude is increased in vitro by rapid pacing, and clinical arrhythmias thought to correspond to DAD-mediated triggered beats are more frequent when the underlying cardiac rate is rapid. In the second type of triggered activity, the key abnormality is marked prolongation of the cardiac action potential. When this occurs, phase 3 repolarization may be interrupted by an early afterdepolarization (EAD). EAD-mediated triggering in vitro and clinical arrhythmias are most common when the underlying heart rate is slow, extracellular K+ is low, and certain drugs that prolong action potential duration (antiarrhythmic and others) are present. EAD-related triggered upstrokes probably reflect inward current through Na+ or Ca2+ channels. EADs is induced much more readily in Purkinje cells and in midmyocardial (or M) cells than in epicardial or endocardial cells. When cardiac repolarization is markedly prolonged, polymorphic ventricular tachycardia with a long QT interval, known as the torsade de pointes syndrome, may occur. This arrhythmia is thought to be caused by EADs, which trigger functional re-entry owing to heterogeneity of action potential durations across the ventricular wall. Congenital long QT syndrome, a disease in which torsades de pointes is common, can be caused by mutations in the genes encoding the Na+ channels or the channels underlying the repolarizing currents IKr and IKs. Antiarrhythmic drugs may block arrhythmias owing to DADs or EADs by two major mechanisms: (1) inhibition of the development of afterdepolarizations, and (2) interference with the inward current (usually through Na+ or Ca2+ channels), which is responsible for the upstroke. Thus arrhythmias owing to digitalis-induced DADs may be inhibited by verapamil (which blocks the development of DAD) or by quinidine (which blocks Na+ channels, thereby elevating the threshold required to produce the abnormal upstroke). Similarly, two approaches are used in arrhythmias related to EAD-induced triggered beats. EADs can be inhibited by shortening action potential duration; in practice, heart rate is accelerated by isoproterenol infusion or by pacing. Triggered beats arising from EADs can be inhibited by Mg2+, without normalizing repolarization in vitro or QT interval, through mechanisms that are not well understood. In patients with a congenitally prolonged QT interval, torsades de pointes often occurs with adrenergic stress; therapy includes b adrenergic blockade (which does not shorten the QT interval) as well as pacing. Drugs that increase action potential duration without direct action on Na+ channels (e.g., by blocking delayed rectifier currents) also will prolong refractoriness. In slow-response tissues, Ca2+ channel block prolongs refractoriness. Hi there, I found your site via Google while searching for a related topic, your web site got here up, it seems good. I have bookmarked to favourites|added to my bookmarks. Found your article really intriguing in fact. I truly really enjoyed browsing it and you simply make pretty some superior points. I am going to bookmark this web-site for that long run! Relly terrific content. I beloved as much as you may receive carried out proper here. The caricature is attractive, your authored subject matter stylish. nevertheless, you command get bought an shakiness over that you would like be delivering the following. sick indisputably come further in the past once more since exactly the similar just about pretty usually within case you shield this hike. Added this url and included your current RSS feeds to my smart phone, enjoyed this a bunch man! Many thanks for an amazing publish and an all-around interesting blogging site! I just want to say I am newbie to blogging and site-building and seriously loved your page. Very likely I’m likely to bookmark your site . You certainly have outstanding article content. Thanks a lot for revealing your web-site. Additional Articles From "Heart Diseases"